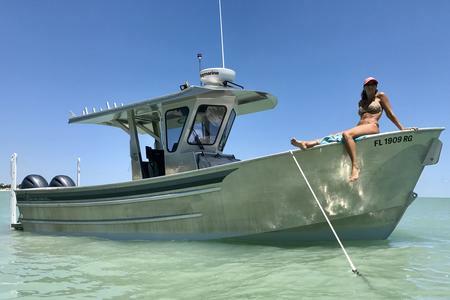 When a fishing boat as experienced as Sanibel Offshore Fishing Charters – “Miss Hayden” has a new first, it really is a big deal. 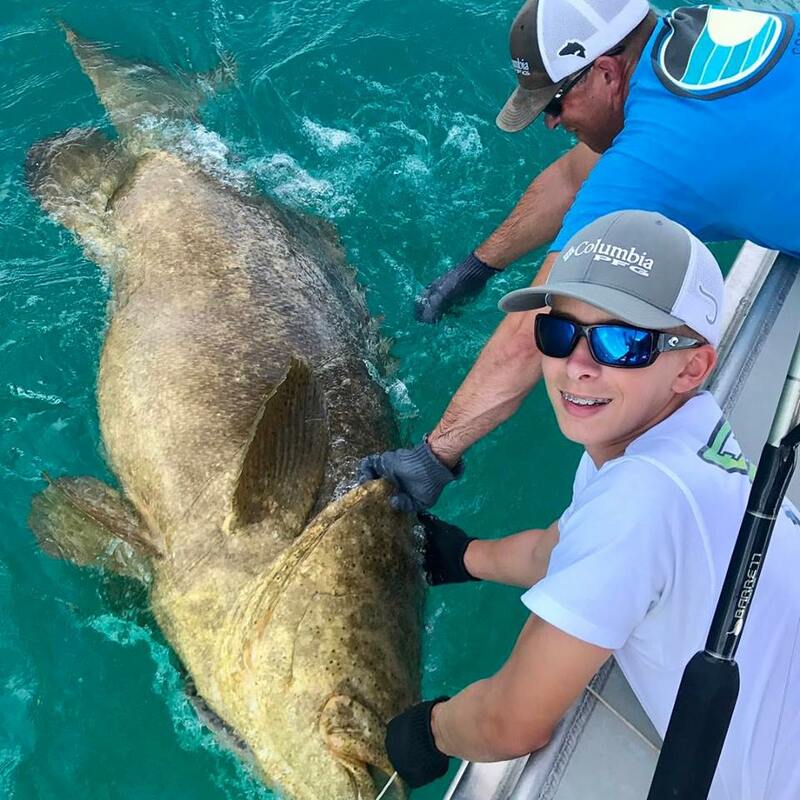 Young angler Tyler is the youngest angler to ever have landed a large Goliath Grouper unassisted! This fish was easily 250 lbs. or more. Tyler achieved this result by staying calm and smoothly applying good technique with a custom built Barrett Rod and a Penn International 80 VSW hooked into a stand up tuna harness system. 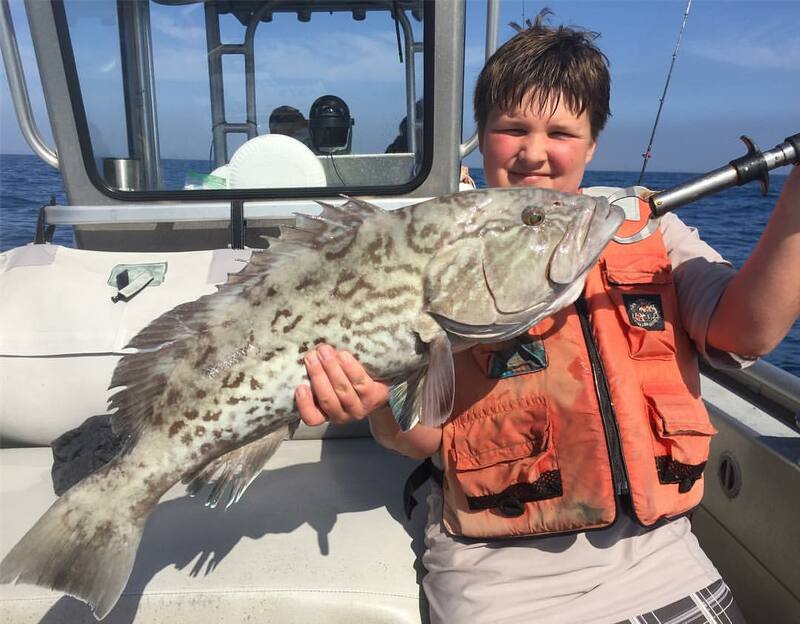 This is a New Boat Record for Youth Fishing! Awesome job, Tyler! Goliath groupers, or also known as Jewfish by locals are the largest of the Atlantic groupers. Goliath are identified as having brown or yellow mottling with small black spots on the head and fins, a large mouth with jawbones that extend well past its small eyes, and a rounded tail. Smaller juvenile Goliath Grouper feature five dark body bands or stripes that become less visible as they grown and age. Goliath grouper can reach 800 pounds and over 8 feet (2 meters) in length. The Florida Goliath Grouper record was caught in 1961 and weighed in at 680 pounds and was caught off Fernandina Beach, FL. Targeted both commercially and recreationally since at least the late 1800s, they were hunted to near extinction until classified as a protected species. Goliath groupers are opportunistic ambush predators that rely on Calico crabs and other slow moving bottom feeding species for their food source. Goliath grouper will also take the opportunity to steal your catch as you reel in your fishing line. Check out this AWESOME video of a shark getting eaten whole by a Goliath grouper. What to do when you’ve caught a goliath grouper? Harvest and possession has been prohibited in both state and federal waters off Florida since 1990. Goliath Grouper must be immediately returned to the water free, alive and unharmed. Photographs can be taken but only during the active act of release. Photographs or any other activities such as measuring the fish should not delay release in any way. Large goliath groupers should be left in the water during release. The skeletal structure of large goliath grouper cannot adequately support their weight out of the water without some type of damage. If a large goliath is brought on-board a vessel or out of the water, it is likely to sustain some form of internal injury. Removing smaller goliath groupers from the water to remove hooks is not necessarily a bad practice, but this process must be done with care, using proper fish handling techniques, and the fish must be returned to the water as expeditiously as possible. What is the “Miss Hayden”? What about the Offshore Fishing in Sanibel? The “MISS HAYDEN” is a 29 foot long by 10 foot wide, super stable Pacific style boat custom designed by Captain Frank and built in Homer Alaska. She is nicknamed the “SEA CADILLAC” because of her comfortable ride even in rough conditions. This is especially critical in the shallow Gulf of Mexico where travelling offshore to some hot spots can take some travel to reach depths. The “Miss Hayden” runs regular offshore fishing trips off of Sanibel, FL. 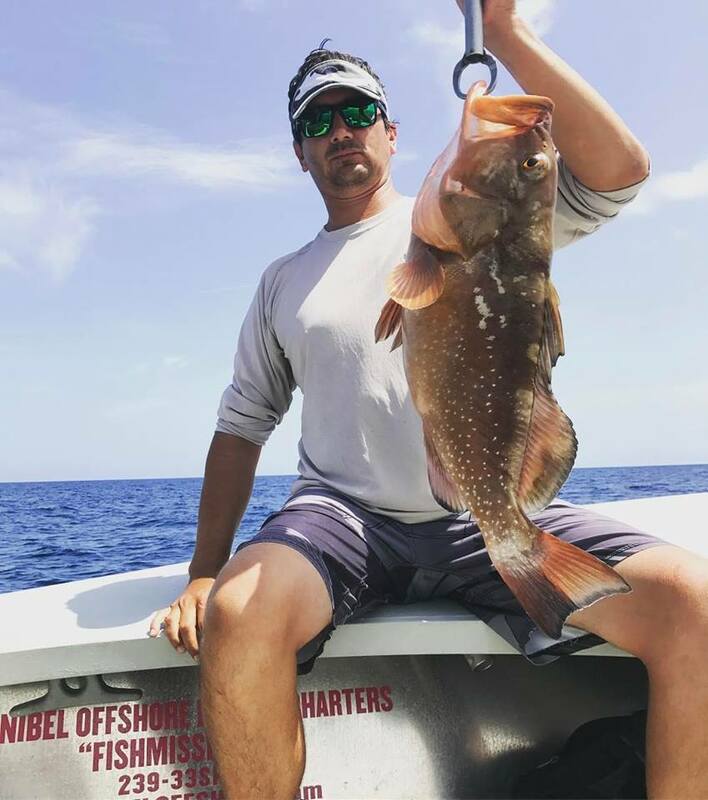 If you are visiting Sanibel or the surrounding area and looking for fishing charters, it is ABSOLUTELY critical that the offshore fishing boat be able to handle offshore waves with ease like you’ll find with the Miss Hayden. Ready to book a vacation fishing charter of a lifetime?